The significance of Rikyu's accomplishment in chanoyu lies partly in the establishment of the concept of 'wabi'. Let us now consider Rikyu's philosophy through something that Rikyu said which has come down to us in the form of an anecdote. In the 'Sawa Shigetsu shu', a collection of Genpaku Sotan's talks about tea, there is the following anecdote. When Kuwayama Sakon asked Rikyu about preparing a tea garden, he quoted a poem by Jien (1151-1225), a Tendai sect monk of the Kamakura period, many of whose poems appeared in the Shinkokin collection of waka, using the poem to show the condition of the tea garden. 'The leaves of the oak have fallen without turning red, the loneliness of a path deep in the mountains leading to a temple'. From the atmosphere that this suggests we can get an idea of the image that Rikyu had of the tea garden. 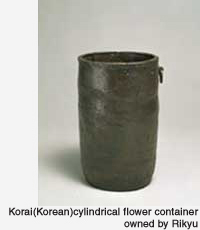 The Korai hanaire is a Nanban (ceramic ware originating in Southeast Asia) cylindrical flower container with a quiet and simple flavour and is known as a symbol of the wabi (taste for the quiet and simple) of Rikyu's later years. The Hachihiraki is a black Raku tea bowl that is one of the Rikyu group of seven tea bowls (Rikyu shichi-shu). If you have these utensils and a bokuseki you will not be lonely, even if you live in the mountains. These words of Rikyu show where his ideal of chanoyu lies. It is not the kind of beauty that can be seen directly, but the kind that can be seen by a mind that searches for the condition of beauty in an atmosphere and for a sufficiency of spirit. In other words, it is a beauty that is seen not with the eyes but with the heart. This is the 'wabi' of Rikyu, and wabi is perhaps the key word for understanding Rikyu's chanoyu.